﻿ Best Price on Casa Drake Lodge in Drake Bay + Reviews! Casa Drake is a Costa Rican family own and operated lodge with a real culture experience. Located at Drake Bay rainforest with access to 3 different beaches: Agujitas, Rincon and San Josecito. 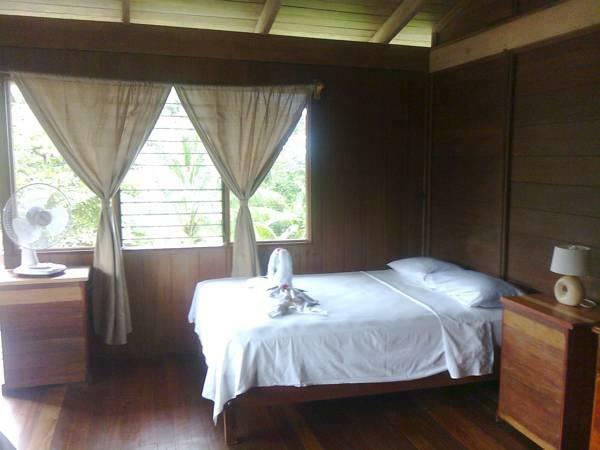 The rooms offer rustic decor with elegant wooden floors, fans and balconies with view to the gardens and forest. Every room has a private non-ensuite bathroom with hot shower and free toiletries. Guest at Casa Drake Lodge will enjoy at the on-site restaurant all typical meals included in the fee. In the gardens, hammocks are available for a relaxing time and enjoy of the regular visitors like toucans, scarlet macaws and monkey. Activities as hikes to Casa Drake´s waterfall and river, horseback riding, birdwatching, canopy tours, dolphin and whale watching can be arranged at this property. Visits to Corcovado National Park and Caño Island are also available and they must be requested with enough time in advance. Casa Drake Lodge is 20 minutes away from Drake local airport and 10 minutes away from Los Planes Ranger Station to Corcovado National Park. Guests are kindly requested to inform the hotel at least 3 day in advance of their estimated time of arrival. This can be noted in the Comments Box during booking or by contacting the hotel/property using the contact details found on the booking confirmation. Please inform the property at least 2 days in advance how you will get to the hotel, if you will arrive by car, you will receive an email with the details and coordinates if you will arrive by airplane to Drake Bay o Sierpe, the property will be able to arrange your transportation. The airport shuttle is one way with 4 people maximum, the guests have to contact the property at least 1 day in advance to arrange the transfer. Please inform Casa Drake Lodge in advance of your expected arrival time. You can use the Special Requests box when booking, or contact the property directly with the contact details provided in your confirmation.